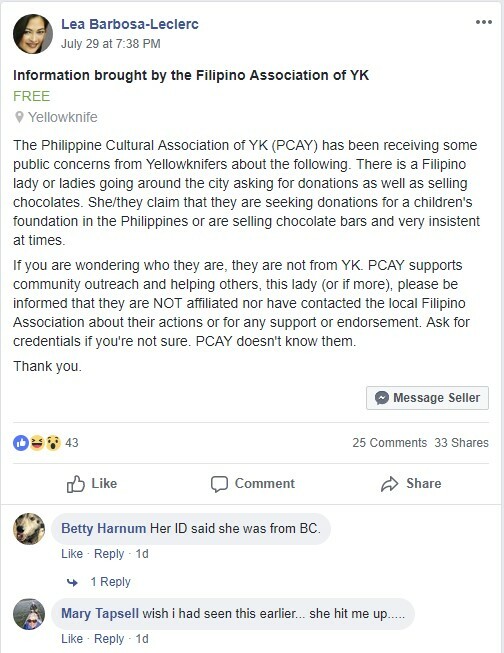 Lea Barbosa-Leclerc, the president of the PCAY says she posted in the Official Yellowknife classifieds Facebook group last week in response to public concerns about solicitors going door-to-door selling Purdy’s chocolate bars and asking for donations. Barbosa-Leclerc says it started with PCAY members contacting her, and people messaging the PCAY Facebook page to find out if the solicitors were associated with the local cultural organization, she says. 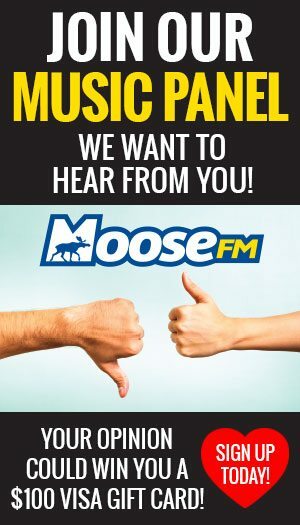 A screenshot of the Facebook post informing Yellowknife residents about solicitors. “They wanted to validate whether we knew about the out of towner Filipinos,” says Barbosa-Leclerc. She did some research and found out that they were from the Children’s Joy Foundation, which is a registered charity with the CRA, but the organization is not registered with the Northwest Territories corporate registry. 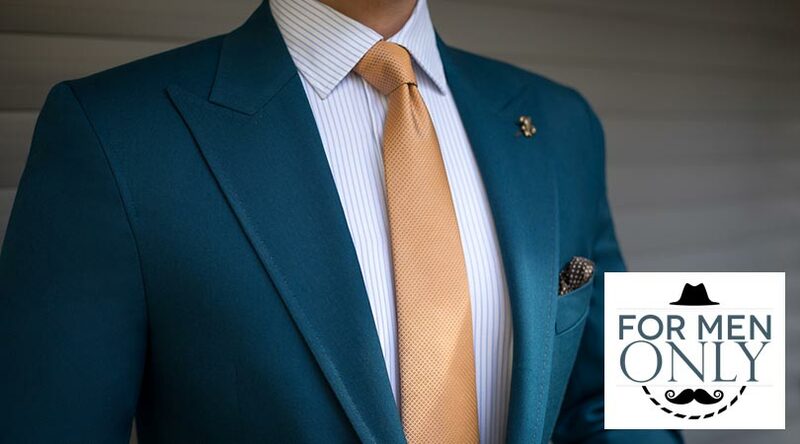 The charity is headquartered in Surrey, B.C., with offices in Alberta, Manitoba, Quebec and Ontario, and has received complaints in the past about their collection tactics. In 2014, Calgary police launched an investigation into the organization’s legitimacy after residents complained the group was aggressive when requesting donations. After seeing locals complaining on Facebook about the door to door tactics of the out-of-towners, she felt she should make a statement that they are not affiliated with the local association. “In 2016 we came to the same sort of situation. There were some Filipinos from out of town who came here,” she says, which prompted the organization’s director to contact her. “Through Facebook messenger, he messaged to me to say that we should be working for the same common good, we should be doing this for the destitute people in the Philippines,” she says. At the time, Barbosa-Leclerc says she suggested that the foundation contact the PCAY the next time they were in town. 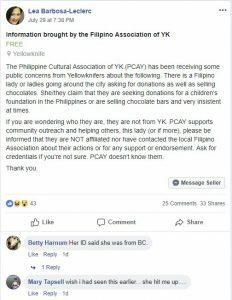 “The Philippine Cultural Association in Yellowknife could maybe pave the way, and maybe we can introduce you properly,” she says she told him. Barbosa-Leclerc says she made the recent Facebook post to clear things up. Barbosa-Leclerc says she believes some of them have asked people for credit cards when cash donations were refused. She says that while she applauds their mission to help others, she just wants them to be transparent about it. The PCAY has a good reputation in town, Barbosa-Leclerc says.